At edX, I help with the Open edX community, which includes being a traffic cop with the flow of pull requests. We have 15 or so different repos that make up the entire platform, so it’s tricky to get a picture of what’s happening where. 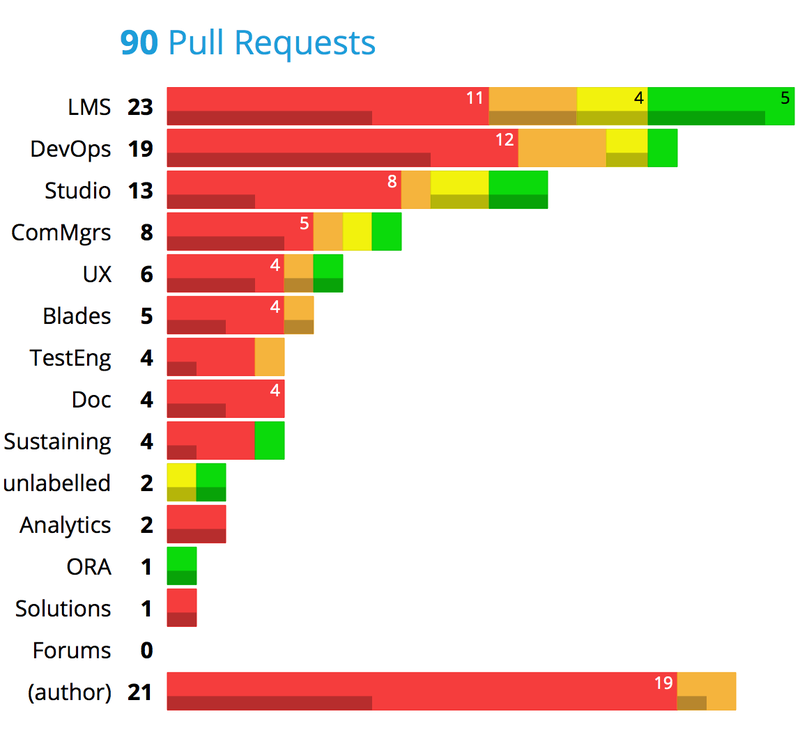 The various teams internal to edX are responsible for reviewing pull requests in their areas of expertise, so this chart is organized by teams, with most-loaded at the top. The colors indicate the time since the pull request was opened. The bars are clickable, showing details of the pull requests in each bunch. This was a fun project because of the new stuff I got to play with along the way. The pull request data is gathered by a Python program running on Heroku, using the GitHub API of course. The summary of the appropriate pull requests are stored in a JSON file. A GitHub webhook pings Heroku when a pull request changes, and the Python updates the JSON. Then I used d3.js in the HTML page to retrieve the JSON, slice and dice it, and build an SVG chart. The clickable bars open to show HTML tables embedded with a foreignObject. This was complicated to get right, but drawing the tables with SVG would be painful, and drawing the bars with HTML would be painful. This let me use the best tool for each job. D3.js is an impressive piece of work, but took some getting used to. Mike Bostock’s writings helped explain what was going on. The key insight: d3 is not a charting library. It’s a way to use data to create pages, of turning data into DOM nodes. So far, the chart seems to have helped edX stay aware of how pull requests are moving. It hasn’t made everything speedy, but at least we know where things are stalled, and it has encouraged teams to try to avoid being at the top. I’d like to add more to it, for example, other ways of sorting and grouping, and more information about the pull requests themselves. The code is part of our repo-tools if you are interested.